This folding thermometer from TFA is ideal for uncomplicated temperature measurement in a wide variety of areas. The monitoring of the core temperature during the barbecuing or roasting of meats, the safe temperature check of baby food, the preparation food in the bakery, pastry or in the catering industry, the control of the refrigerated counter at the butcher’s or in the supermarket, stock checking or the incoming goods inspection in the canteen kitchen or food industry, these are all the possible uses of the "THERMO JACK PRO". 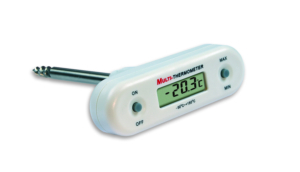 Food of all kinds in particular can be measured quickly, accurately and effortlessly with this handy thermometer. The practical folding mechanism makes it easy to use. Unfold the probe, insert it into what needs to be checked and within a short time the device will display the exact temperature. Just fold it back after use and it will switch off right away. Put it into your trouser pocket and it will be easy to reach for the next use. 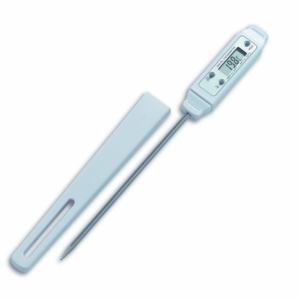 The thermometer is HACCP and EN 13485 compliant and well suited for the professional use in industry, trade, commerce and laboratory. Thanks to its specially shaped measuring tip, the "THERMO JACK PRO" precisely measures the temperature in just 4 seconds. The device is jet-proof and can be cleaned under running water after use.